Youth Ambassador for the Rainbow Pride Foundation, Suva, Fiji. 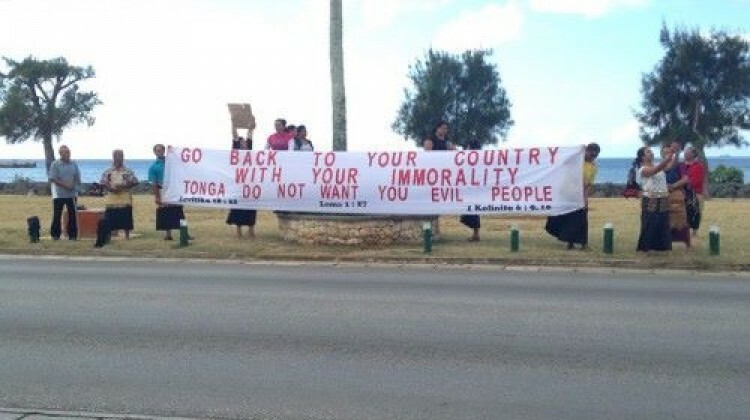 ‘Go back to your country with your immorality, Tonga do not want you evil people’. That was the banner message faced by attendees at the first ever Pacific Human Rights Conference on Sexual Orientation and Gender Identity (held on May 11-14 in Nukualofa, Kingdom of Tonga), thanks to church-based protesters who picketed the conference. It was a challenge; we, the attendees, had gathered together to celebrate our skills and resilience and to strategise together to help develop a fairer, more accepting future for people of diverse gender and sexual identities in Pasifika countries. Having all faced stigma and discrimination in our daily lives we were not surprised to see the protest, but it was a disappointment—and a reminder of just how far we have to go before lesbian, gay, bisexual, trans, queer and intersex people (LGBTQI) are treated equally to non-LGBT people. We had the Tongan Royal Family on our side, however. Her Highness, Princess Salote Lupepau’u is a strong and vocal supporter of LGBTQI rights in Tonga. She attended the conference, and encouraged us all to turn our attention away from the protesters and towards the future. Together, we reminded ourselves that the protesters served as a reminder of how strong are the misconceptions that people hold when it comes to LGBTQI people. The protesters increased our motivation: both to make the most of this ground-breaking conference, and to return to our own countries and continue our work on sensitising our Pacific brothers and sisters who are not aware of our issues. The conference, titled ‘Our Voices, our Communities, our Rights: Advancing Human Rights related to Sexual Orientation, Gender Identity & Expression in the Pacific’ was organized by the Pacific Sexual Diversity Network (PSDN) in cooperation with its partners, ARC International and Fiji-based DIVA for Equality. Improve understanding and strengthen collaborations amongst key stakeholders about health and human rights issues. It was an intense and exciting four days. We talked, we listened, we learned from each other. We also claimed back some of the religious space denied to us by the protesters; one of the key topics that kept resurfacing through the conference was that of LGBTIQ people and their personal, group and national experiences of ethics, spirituality, and religion. Overall, the conference was a space of sharing of ideas, experiences, and strategies, as well as an incredible site for information gathering. Most of all it allowed the Pacific delegates to expand their networks, and to feel empowered to do more for their communities. The conference ended with the Annual General Meeting of the Pacific Sexual and Diversity Network, as well as voting for the next Pacific Human Rights Conference host. Cook Islands came out as victors and thus, will be the next host of the conference in 2017. We look forward to saying ‘kia orana’.